Indian Parliament Passes Anti-Graft Bill: Is Legislation the Answer to Corruption? India’s mainstream national parties see the new legislation as an attempt to neutralize the influence of the AAP. The bill was first introduced in parliament 46 years ago and since then more than ten attempts were made to pass it into law. Until now, it just could not muster political support. But there is a world of difference between India of 1968 and India of 2013, and the political reality is very different now than in the past. 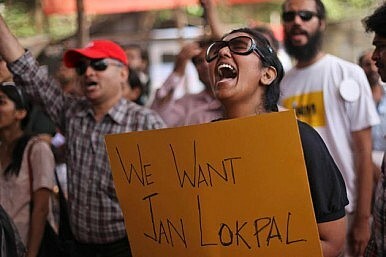 The passage of the landmark Anti-Corruption Bill, popularly known as Lokpal Bill (Ombudsman Bill), by both houses of parliament this week is a byproduct of this changing context and reality of Indian politics. Never before in independent India has a bill been passed under such public pressure and scrutiny. There have been a few instances in parliamentary history where both major political parties — the Indian National Congress and the Bharatiya Janata Party (BJP) — came together and passed a law of such a historic importance in a hurry, without any elaborate debate. The Upper House debated the bill for five hours and the Lower House cleared the bill within an hour. The bill now awaits the signature of the President which is a mere formality. The law creates an ombudsman that has the authority to investigate and prosecute politicians and civil servants for corruption. The Prime Minister’s office also comes under its purview, a major change over the 2011 draft which kept the PM out of the purview of any watchdog. The anti-graft law is aimed at curbing corruption and bribe taking at different levels of government and bureaucracy. The bill also envisages the creation of similar anti-graft institutions at the state level. One significant achievement of the new constitutional structure is the inclusion of the main investigating agency, Central Bureau of Investigation (CBI), under the supervision of the ombudsman. The new authority has the power to monitor all cases referred by it to the CBI. But the main question on everyone’s minds is not about the nature of the bill but why so much urgency was shown in passing it into law. The political context in New Delhi changed after the resounding victory of Aam Aadmi Party (AAP, or Common Man’s Party) in the Delhi Assembly elections. The party’s anti-corruption platform brought it close to the halfway mark in the 70 member Assembly. It delivered a humiliating defeat to the ruling Congress and stopped the march of the opposition BJP, which came out four seats short of a simple majority. Their defeat at the hands of a political neophyte — the AAP was formed less than a year ago — shook the smugness of the established political players. The second political context was the hunger strike by the veteran political and social activist, Anna Hazare, who started a fast unto death from December 9, the day the parliament session started, on the issue of anti-corruption. He vowed not to break his strike unless the parliamentarians pass the anti-graft bill. The 76 year old Gandhian had the last laugh on Wednesday evening when he broke his fast. Sensing that corruption is a big issue with voters, the two major parties, in a rare gesture of camaraderie, saw the bill through both houses of parliament. Congress Party Vice President Rahul Gandhi, a probable prime ministerial candidate for the party, showed rare public activism in mobilizing political support for the legislation. He also engaged Hazare in discussion. By supporting the bill in parliament, the BJP also tried to demonstrate its keenness for probity in public life. However, the AAP — most of its leaders were part of Hazare’s team when the anti-corruption movement started in 2011 — expressed its disapproval of the anti-graft bill. Its leader Arvind Kejriwal termed the anti-graft legislation “weak” and vowed to continue his struggle for stronger legislation. Analysts read the rift between anti-corruption activists as a boost to the established political parties. One can see this in Rahul Gandhi’s activism, trying to claim credit for the new anti-graft measures; the idea is to hijack the anti-corruption plank from the AAP by bringing Hazare on board. So political observers see the passage of the bill as an attempt to change the headlines and dilute the popular perception that the Congress-led government is mired in financial scandal and political graft. The ruling party sees its recent drubbing in state elections as a mandate against its image. How far this course correction, so close to the general elections, is going to help the government in Delhi is unclear, but one thing is certain: the Congress is fighting an uphill battle both at the political level and in terms of perceptions. The very fact that the BJP could not secure a majority in the Delhi Assembly elections, despite having predominant support among urban constituencies and the middle class, is a matter of concern for the right-wing opposition group. People’s trust in the party is low despite being in opposition for more than a decade. The party also hopes to derive some moral advantage by supporting the anti-corruption law. Therefore, both mainstream national parties see the new legislation as an attempt to neutralize the increasing influence of the AAP. Politics apart, will the new anti-corruption law help in curbing all prevailing corruption in public life? One major source of political corruption is election finance. Political parties mobilize funds from industrial houses, contractors, and all kinds of people whose credentials are not always tested or known. Those who finance election campaigns expect some their monies to win them leeway and favor, which leads to wheeling and dealing and lays the groundwork for scandals and graft. Unless there is public funding for election campaigns, corruption will remain an inbuilt problem in the system. Only time will tell how effective the anti-graft bill is going to be in curbing corruption in public life. The legislation, however, demonstrates the intent of the people to deal with the debilitating influence of graft in the growth of the country. As India gears up for parliamentary elections, what can voters expect?